Hello, your drag/drop implementation is extremely powerfull and works very smoothely, thank you for sharing such quality code. Nevertheless I encounter this issue: adding a tooltip to the closeable tab breaks the drag/drop feature (e.g adding label.setToolTipText("test"); or this.setToolTipText("test"); after line 576). I reproduce the issue both on Windows and Linux (Java 7), have you any clue for a workaround? Hi ron190jSQL, thank you for your very useful information. 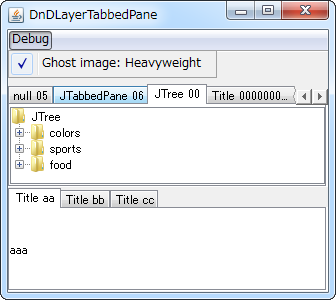 Maybe the ButtonTabComponent(JLabel or JPanel, has the tooltip text) steal all mouse events(drag, select...). So need to use `JTabbedPane#setToolTipTextAt(int, String)` control instead of `JLabel#setToolTipText(String)`.